Change, change management and development by changing of your stories. Storytelling work is usually an extraordinarily complex and costly process. This is due to the fact that storytelling is particularly suitable for such imprecise and complex relationships as environment, networks, systemic approaches to detect and manipulate. I focus on the range of mini- or micro-stories, that is, narrative forms of everyday life, which are usually short formulated, but have the most significant penetrating power in arguments, the most memorable effect. Mythical narrative is an original, archaic form of recounting personal experiences. Mythical narrative is shaped by the immediacy of the experience. Special items are the dramatization by personalizing and analogizing to overcome limits of comprehension, which are caused by different worlds of experience (such as the world of the steppe dwellers in contrast to the world of the residents of the coast dwellers or the seamen, manifested in the Yahwistic and Elohistic Genesis creation narrative). Narratives aka story telling has played a special role in the Humanization. Bernhard Victorri even defined man as „homo narrans“. However, the narrative does not have to adopt verbal forms necessarily : „At your deeds you shall know them!“ is a reference to the fact that also the products of deeds, for example, the hand axe, or a particular way of doing something, as in techniques of making the hand axe or an Egyptian relief, are forms of narration. This may be one of the ideas by McLuhan when he describes media as extension of man and the media as the message (massage). Logical narrative is shaped by accounts or representations that relate to each other in the form: “ If ? then …“, or „Because ? therefore“. Logical narrative is a special form of storytelling, usually understood as modern and scientific. Therefore Logos is able to claim that is has replaced myth as a more modern(?) form of storytelling. What makes this technique of media-based transmission of information so important, is it’s speed that allows the information to spread fast. This speed has also contributed to the exponential increase of information, which has continued until today and which we now call the history of humankind. StoryWay/ Narrative simplifies the process of communicating knowledge. It makes teaching and learning easier. Learning as well as communicating is more effective if it draws on the possibilities of the logos and the myth as well. 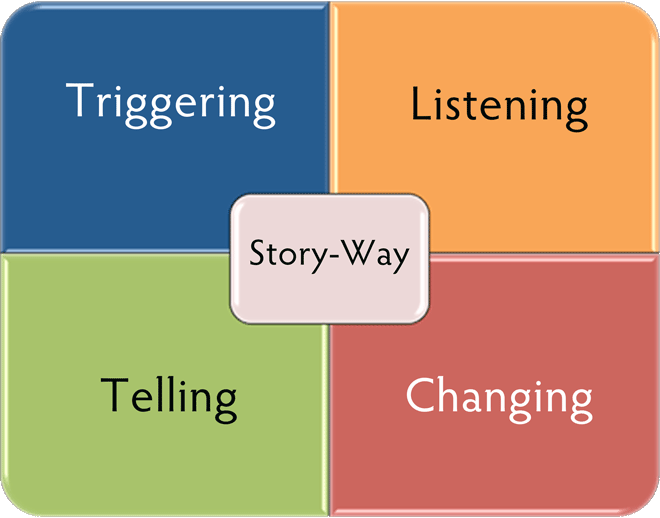 Thus media education always also means to walk the path of stories, the StoryWay. You can’t hide from success? Success will maybe find you? But can you tell others about your success? Do you know which stories are told about you or your company in your region? What kind of stories are associated with your products? Which stories are told in your business? In which way are they told? Are those stories about your company, yourself and your coworkers? Which stories may a customer spread about you? Who are the real heroes of those stories? How do employees talk about your company? Are they telling success stories or stories of failure? Which form of storytelling is used more often: the mythical or the logical form? Everyone has a story and that story is told as part of a whole collection of other stories. Listening to those stories and analyzing them from the perspective of literary studies will contribute to important insights concerning the mental state of humans. The deliberate modification of people’s stories can initiate and support a certain process of change. People who undergo such a process will learn to look for structures within their own stories and within stories of others. They will be able to draw their own tentative conclusions from analyzing those structures. They will learn to gently reshape the narration of stories about yourself or about others and thus they will learn to change the perception of their own history. Do you become the stories that others tell about you? Are you able to exert influence on this stories? OK, let’s start to change your stories! Every story has two equal partners, storyteller and storylistener! Together they may find the right way and go a while together up to a time when both are able to find their own way to tell their own real story. Vision, ideas, ideals, creation in mind.